Is there any conceptual common nonlinear resonance ground shared between the ECM and the underlying theory explaining LENR? ANSWER: Low Energy Nuclear Reactions (LENR) are indeed very interesting. I have concluded that whatever process we observe in any area of science will be discovered in all layers. 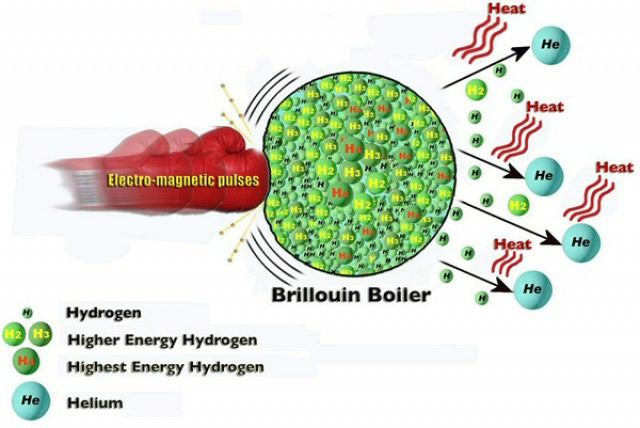 What many consider “cold fusion” may not be fusion at all. The Widom-Larsen theory does not require any new physics discovery of laws. Essentially, the Widom-Larsen theory states what is actually taking place is a multistep process. The Plasmon modes in hydrated metals (like surface electrons acting collectively as a herd or mob) are energized in various ways and are then absorbed by protons. This produces a very low energy neutron, which is the reverse of neutron decay, due to the weak nuclear force. Now these low-energy neutrons are absorbed rather easily. Consequently, this creates a cascade effect of unstable isotopes that go into beta decay. During the beta decay phase, gamma ray photons are ejected and collide, hitting the metal Plasmon. At that moment, they are shifted (like a phase transition) into mostly IR (heat) with a soft X-ray tail. This would explain cold fusion, which is a hypothetical type of nuclear reaction at room temperature. This is the opposite of what takes place in the sun. There is currently no accepted theoretical model that would allow cold fusion to occur. I can say that the Widom-Larsen theory would appear to follow the structural design of economic changes as well. 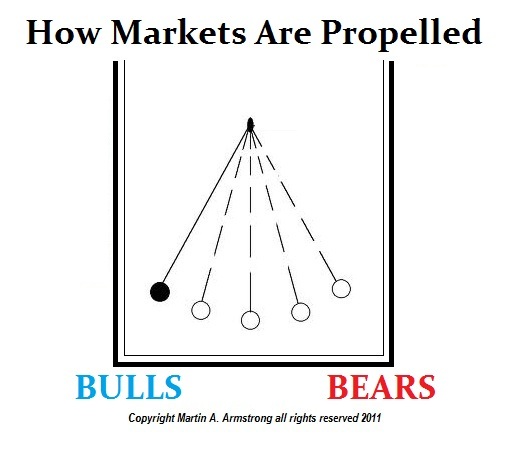 The majority must be wrong; that becomes the catalyst where the smallest amount of pressure against an overextended market at tops or bottoms creates the reversal in trend and the biggest move of energy. This phase transition creates spike highs and waterfall events of cascade failure that results in major panic lows. Every investigation assumes some huge player has overpowered the market, but no one has ever been discovered since 1907. The source of energy comes from within. The punch can be anything. The system is set up at an extreme, so it can be akin to a herd of zebra –– one zebra sees a lion and begins to run, which causes the other zebras to start running, despite never seeing the lion. This is the release of energy (heat so to speak) from a resting body.